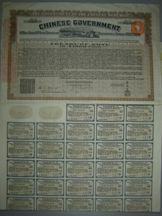 12 China, 1919 8% Sterling Treasury Note (Vickers Loan) bond for £100, dockside vignette, green & black, with coupons. With transfer form. VF. 9 China, Chinese Government Treasury Notes, dated 1919, (Vickers Loan), bond No.10254 for £1,000, vignette of river scene, black & brown, with coupons, AVF. (1). 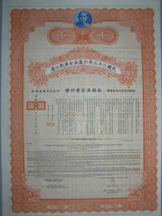 17 China, Chinese Government Treasury Notes, dated 1919, (Vickers Loan), bond No.9530 for £500, vignette of river scene, black & blue, with coupons, there are visible signs that this bond has been framed at some stage, otherwise, VF. (1). 14 China, Chinese Government Treasury Notes, dated 1919, (Vickers Loan), bond No.10093 for £1,000, vignette of river scene, black & brown, with coupons, there are visible signs that this bond has been framed at some stage, some fading, otherwise, AVF. (1)..
44 China, The Ministry of Finance Regular Treasury Notes of 1920, bond for half a yuan, ornate design, small format, text in Chinese, black on blue, VF. (1). 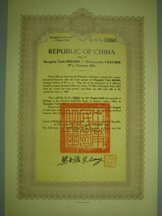 16 China, Chinese Government Treasury Notes, dated 1919, (Vickers Loan), bond No.4554 for £100, vignette of river scene, black & green, with coupons, there are visible signs that this bond has been framed at some stage, otherwise, VF. (1). 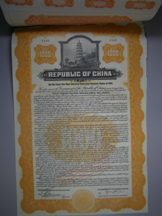 25 China, Republic of China Two Year 1919 Gold Loan Treasury Notes, bond No.1755 for $1,000, attractive vignette of pagoda, black & orange, with new coupons and scrip certificate, the right margin is uneven where original coupons cut, otherwise VF. (1). 17 China, Chinese Government Treasury Notes, dated 1919, (Vickers Loan), bond No.10288 for £1,000, vignette of river scene, black & brown, with coupons, AVF. (1). 18 China, Chinese Government Treasury Notes, dated 1919, (Vickers Loan), bond No.9684 for £500, vignette of river scene, black & blue, with coupons, a few pinholes at top left, otherwise VF. (1). 16 China, Chinese Government Treasury Notes, dated 1919, (Vickers Loan), 2 x bonds for £100, vignette of river scene, black & green, with coupons, both VF. (2). 1077 China, Chinese Government Treasury Notes, 1919 Vickers Loan, 5 x bonds for £100, all with vignette of river scene, black & green, all with coupons, mostly VF. (5). 1076 China, Chinese Government Treasury Notes, 1919 Vickers Loan, 5 x bonds for £100, all with vignette of river scene, black & green, all with coupons, mostly VF. (5). 1075 China, Chinese Government Treasury Notes, 1919 Vickers Loan, 4 x bonds for £100, all with vignette of river scene, black & green, all with coupons, mostly VF. (4).